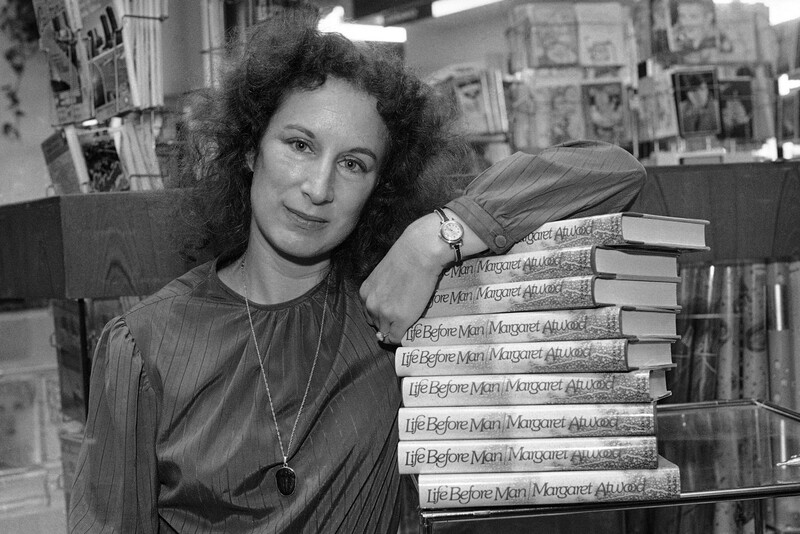 With a writing career spanning six decades, Margaret Atwood’s list of accolades is, put simply, remarkable. 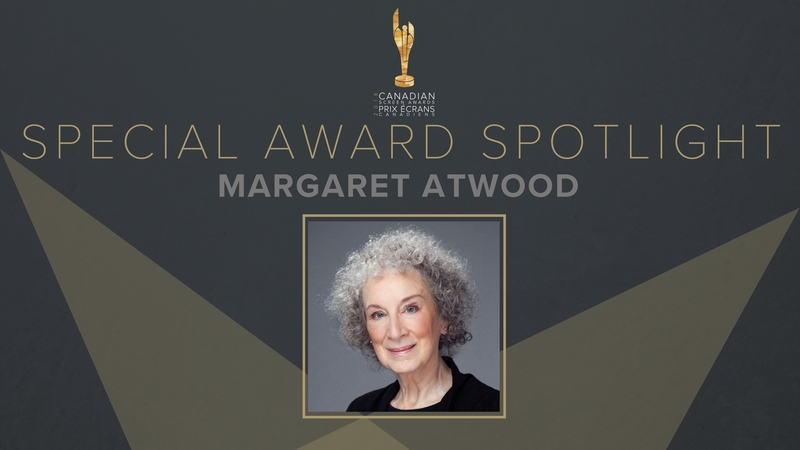 She’s won the Arthur C. Clarke Award (1987, The Handmaid’s Tale), the Booker Prize (2000, The Blind Assassin), the Governor General’s Award (twice), the Trillium Book Award (thrice! ), and has received dozens of honourary degrees from leading universities around the world. Cognizant of her buckling mantel, the Academy of Canadian Cinema & Television’s Board of Directors is, nevertheless, excited to pay tribute to an author, poet, activist, and feminist who, in addition to writing words that have inspired readers at home and abroad for years, has been the nucleus for a recent surge in excellent Canadian television, including Alias Grace, adapted by Sarah Polley and directed by Mary Harron, and CBC Kids’ Wandering Wenda, which strives to teach young audiences the alphabet in 26 uniquely alliterative episodes. And—of course—while it’s not explicitly Canadian, there’s also Hulu’s adaptation of The Handmaid’s Tale, which saw, back in September, Oprah Winfrey announcing its Outstanding Drama Series win onstage at the 69th Emmy Awards, its eighth statuette of the night. “Go home, get to work, we have a lot of things to fight for,” said producer Bruce Miller as Elisabeth Moss, Margaret Atwood, and the entire Handmaid’s Tale team received a standing ovation. 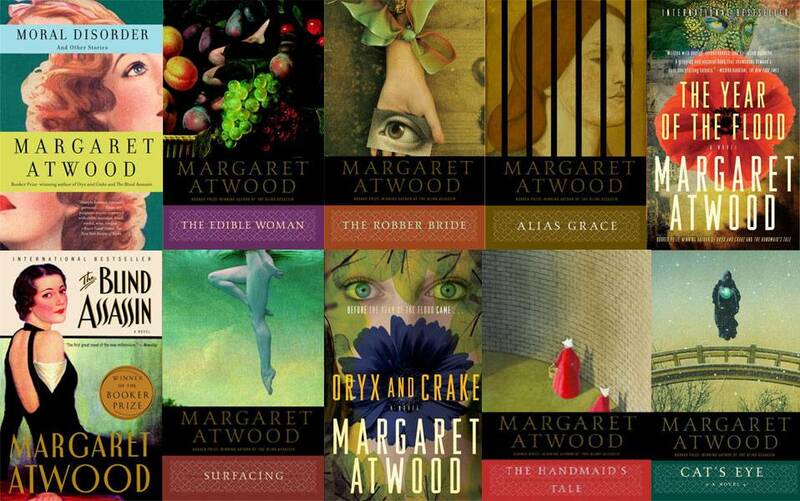 Needless to say: these are positive outcomes for Ms. Atwood, whose otherwise dystopian visions in novels Oryx and Crake, The Year of the Flood, and MaddAddam inform her activism towards protecting wildlife and combating climate change. Green things sprout over at the O. W. Toad office (“O. W. Toad” being an anagram for “Atwood”), where her Toronto team uses sustainable paper, power, and overall limits their carbon footprint, avoiding air travel whenever possible, and buying Carbon Neutral Credits when they must take to the skies. Outside of Toronto, on Pelee Island near Lake Erie, Atwood and husband Graeme Gibson spend their downtime birdwatching with the Pelee Island Bird Observatory (“PIBO”), which Gibson heads as chair. Birds aren’t just fancy fliers to Atwood and Gibson: they’re central to the environment, and protecting them—and the earth they fly and nest over—is vital to the future of the world. 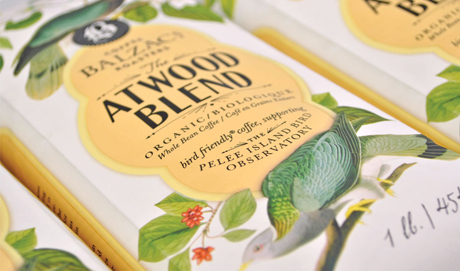 “Wake-up call” could be a great nickname for Atwood Blend, the amber roast blend of coffee sold by Balzac’s (proceeds raise funds for PIBO) that proudly boasts the Smithsonian Migratory Bird Center’s bird friendly seal of approval on its label, ensuring consumers that the beans are 100% organic and raised with shade-grown certifications. Shade-grown coffee, for non-ornithologists, is a certification that’s getting harder and harder to find: natural canopies around North America are being deforested, leaving migratory birds fewer trees to find and roost—hence the importance of Atwood Blend. 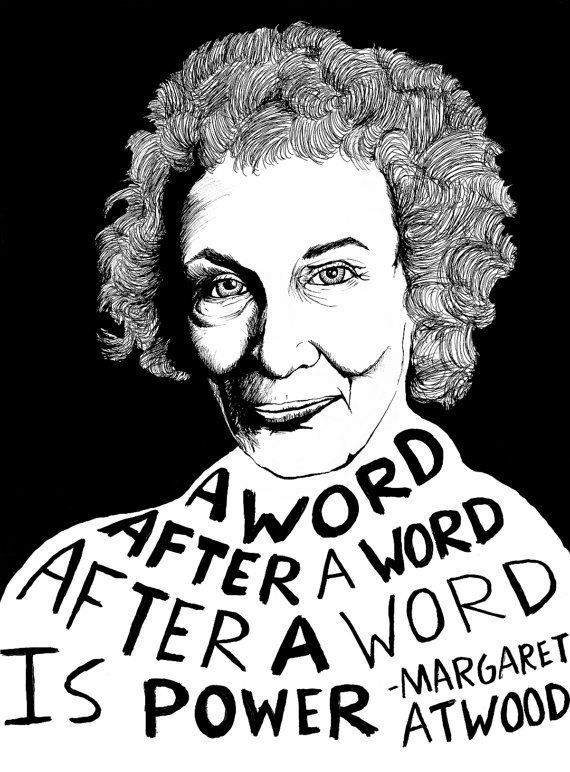 Activism, short stories, graphic novels, coffee: one wonders how she has energy for it all—yet at 78 years young, she shows no signs of slowing, especially as her name and work find new audiences on the small screen (with more to come, including the hotly anticipated second season of The Handmaid’s Tale, and MGM’s upcoming production of Atwood’s 2015 novel The Heart Goes Last). In the meantime, we’re honoured to present Ms. Atwood—legendary Canadian, inimitable author, champion of the environment—our Academy Board of Directors’ Tribute.